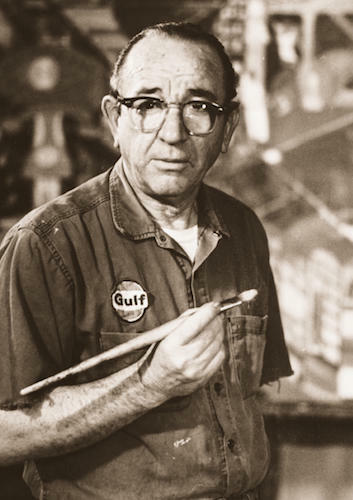 Ralph Fasanella was born on Labor Day in 1914 and died on December 16, 1997. He worked in machine shops and dress shops, drove trucks, pumped gas and organized workers for higher wages and a better life. One of Fasanella’s most famous paintings portrays the 1912 Lawrence textile strike where tens of thousands of workers marched for “Bread and Roses” too. Another, “District 65 Build Your Union” shows an idealized union headquarters where members meet to discuss workplace problems and vote for their leaders. It is also a place where they gather for lectures, to borrow books, watch movies, attend art shows and dance to live music. After dropping out of school to work on his father’s ice truck, Fasanella became a voracious reader and a life-long devotee of public libraries. He was a political activist and a fervent believer that we all have a duty to make the world a better place for future generations.